The best basketball program in the country. General George S. Patton said this: `Instead of waiting to see what might develop, attack constantly, vigorously and viciously. Never let up, never stop, always attack.' As a football team, we will always be attacking. Carolina style football will be known as playing smart, playing fast and playing physical. Joel Berry and the Heels playing March Madness very well! The best in the business has retired...always loved hearing Woody's voice calling great Carolina moments. Rumor has it that this photo was taken inside the demon's lair (Cameron Indoor)...this photo taken in the visitors locker room! Good Lord....the following was written by Tyler's father for Tar Heel Monthly....it may be the best thing I have ever read about Carolina and Carolina basketball. Would you call him a failure? He was a little kid and he couldn't quite raise the ball to the basket. He put the ball way down by his hip and pushed with everything he had. But the ball just wouldn't get over the rim. Still, he stayed there all alone, flinging the ball upward again and again. He never did make one that day but he stayed there a long, long time. 46 months ago my son left his home almost 800 miles behind to pursue his lifelong dream as a student athlete at the University of North Carolina. He was tall, then, shy boy with a fear of lying, elevators and failure. Although a good athlete, his greatest attribute could not be measured in the weight room or with a stop watch and tape measure. As a McDonalds's All Star American, he had many opportunities to play much closer to his Midwestern, small-town, roots. He made the journey because of his faith that Roy Williams and his staff would be able to nurture that attribute. I watched him struggle through the lonely, homeless feeling that all college freshmen experience. On one of my first visits, I watched as almost 42 feet of gangly limbs, elbows and feet piled out of Marcus Ginyard's ex- police cruiser. They looked like a gaggle of newborn colts, this young group of Carolina freshmen. SI said they would lucky to make the NIT. Then came my first visit to the Dean Smith Center. UNC was playing the Illinois, the 2005 NCAA runner-up. There was my son wearing the legendary blue Tar Heels uniform. The English language has no words to describe how I felt. The games and the days went by. Friends and leaders such as Wes Miller and David Noel helped the young players find their way on and off the court. In late March, I saw the second-greatest game of my life. In the insane asylum known as Cameron Indoor Stadium, this young team beat J.J. Redick and Shelden Williams on Senior Night. All life is full of peaks and valleys. The summit of the win at Durham gave way to the canyon of a second round loss to George Mason. I watched as Tyler and his teammates dealt with that loss. The measure of a man is not that he gets knocked down but how he gets back up. Tyler took out his torment by stealing his body. With the help of Jonas Sahratian, he pulled cars around the Smith Center parking lot. Still chasing that dream. The next year, Roy William's team gained some respect. Tyler learned to show dignity and class by resisting the opportunity to criticize even when that opportunity left him with a broken nose. He was learning the Carolina Way. Fate once again presented its hills and valleys to my son and Carolina fans. The ride to the final four was stopped one game short by a painful loss to Georgetown. My son also learned a bitter lesson in perspective. The disappointing defeat paled next to the tragic loss of Jason Ray on that same, cruel New Jersey night. The next year again held great peaks and valleys for my son and the Tar Heel family. He saw one of his good friends go down with a season-ending injury. But we made it to the Final Four. The thrill quickly died when a great Kansas team eliminated us. Tyler was to receive many individual accolades that year. As with any team sport, a large cast of characters contributed to any one person's success. During the middle of these honors, Tyler called me. It was a typical Tyler call, only this time there was a slight quiver in his voice. "Dad", he began, "I try not to think of individual things when we have so much to accomplish as a team, but Dad, when I came here I never thought my jersey would be retired in the rafters of the Smith Center." Again, words fail me as I try to describe my feelings at that moment. As late spring approached, the same decision had to be made that had been made in the past three years. Tyler decided to stay at UNC for his senior year. The night of the NBA draft he spoke again, Dad, when I get through, I'll have something that the rest of them don't. A college degree.” National player of the year with a college degree. An all too rare combination. As I write this in late January, no one knows what where this years roller coaster ride will go. I do know that the boy who left Poplar Bluff, Missouri almost for years ago is a little taller and not really thin anymore. He has flown more miles than an arctic tern. He has ridden elevators to the top suites of the finest hotels in our great country. And on a magical night in late December, that formerly shy, young boy gave one of the most gracious speeches I have ever heard. That young boy from Poplar Bluff is now a man we can all be proud of. His physique, character and mind have all been chiseled into granite. H came to the University of North Carolina to chase a dream. While chasing that dream, he has come to live it every day. All of this comes from trusting one very remarkable man. To Roy Williams, Joe Holladay and the wonderful coaching staff. To all Tylers teammates and friends at North Carolina. To Tar Heel fans everywhere. On behalf of myself and my family, thank you for allowing my son to be a part of the greatest basketball family on the planet: The Tar Heels Nation. DO YOU BLEED BLUE? Think you know North Carolina history? Championships - that's how we roll. MrTarheel is the fan site for the UNC Tar Heels with a primary emphasis on UNC basketball and UNC football. It is our goal to provide information, resources and content to make following the North Carolina Tar Heels easier and more enjoyable. There are Tar Heel fans everywhere and a large portion of them are not alumni. They follow the Tar Heels because of the tradition of excellence they see in the programs and the University. Tar Heel basketball fans are living in their own "blue heaven" right now with coach Roy Williams at the helm. Dean Smith was the best and Bill Guthridge was a solid replacement but Roy Williams has established himself as team builder, a championship coach and a role model. Read more about the Tar Heel basketball team at our UNC basketball page. 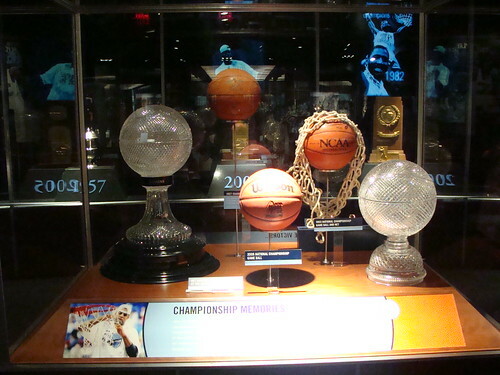 The University of North Carolina at Chapel Hill has won 37 team national championships in five different sports, 8th all-time, and 51 individual national championships. The UNC women's soccer team has won nineteen national championships since 1981; the men's soccer team won the championship in 2001; the women's basketball team in 1994; the UNC Tarheels basketball (men's) team in 1924, 1957, 1982, 1993, 2005, and 2009; the UNC men's lacrosse team in 1982, 1986, and 1991; the UNC women's field hockey team in 1985, 1995, 1996, and 1997; the women's team handball team won in 2004; and the men's team handball team has won the last three National Championships in 2004, 2005, and 2006. The Carolina men's crew team won the 2004 ECAC National Invitational Collegiate Regatta in the varsity eight category. The North Carolina Tarheels Men's Baseball team is also a perennial power, and in 2006 made it to the Championship round of the College World Series. If you haven't had a chance to visit the campus of the University of North Carolina at Chapel Hill then you have missed a real treat. As most folks who have been here will tell you, the campus really sells itself. Aspiring students only need to visit once and they are usually hooked. The campus provides a terrific setting for learning and excellence. Mr TarHeel believes everyone should become a UNC Tar Heel fan. If you are not, he recommends you watch lots of North Carolina basketball this season, attend a UNC football game, buy some UNC clothing and wear it often, and come back to MrTarHeel often. IF GOD ISN'T A TAR HEEL THEN WHY IS THE SKY CAROLINA BLUE? Check out these DOOK photoshops! At MrTarHeel.com we have most everything you could want...we've got desktop wallpapers for your computer, we've got audio for your ears, we've got links to shirts and gear to make you look like a Tar Heel, we've got quizzes on the North Carolina Tarheels to test your brain, we've got links to North Carolina Tar Heel resources on the web. Have at it and Go Heels! Jones Angell great Carolina guy and does a good job as the radio voice for the Heels. "If the mailman stopped everytime a dog barked the mail wouldn't get delivered." Don't let a day pass when you don't do something for someone who can't repay you. "If you treat every situation as a life-and-death matter, you'll die lots of times." "Basketball is a team game. But that doesn't mean all 5 players should get the same amount of shots." "you had 2 more rebounds than Wanda"
Try the Tar Heel IQ quiz! Here's a quiz to test your knowledge of UNC sports history...see how you do. 9. The 3 good looking coeds were graduating. 8. I didn't want a mullett. 7. My career aspirations went beyond farming. 6. Guys chasing Lassie wasn't my thing. 5. My S.A.T score was too high. 4. Wasn't impressed with the cafeteria walls being covered with "Dukes Of Hazzard" posters. 3. They hired Chuck Amato. 2. I already had a high school education. For nearly 70 years the mascot of the North Carolina football team has been a ram. A UNC cheerleader decided the school needed an animal mascot to serve as a symbol, just like Georgia's bulldog and N.C. State's wolf. Two years earlier the Tar Heels had posted a brilliant 9-1 record. The star of that 1922 team was a bruising fullback named Jack Merritt. Merritt was nicknamed "the battering ram" for the way he plunged into lines. It seemed natural to link a mascot with Merritt's unusual sobriquet. Thus, it was decided to purchase a ram named Rameses the First. The ram was introduced before the game with VMI, who was favored to beat the North Carolina Tar Heels. Late in the game, Carolina's Bunn Hackney was called upon to attempt a field goal. Before taking the field, he stopped to rub Rameses' head for good luck. Seconds later Hackney's 30-yard dropkick sailed between the goalposts, giving the Tar Heels a 3-0 victory.